Welcome home to GREAT views at the base of Texas Hill Country in Helotes. Surrounded by the beauty of the Texas Hill County, the City of Helotes is a vibrant community boasting a flourishing economy and a high quality of life and located just northwest of San Antonio. The City of Helotes is a unique community that maintains its small town tranquility and family-oriented activities. Citizens remain committed to economic prosperity while balancing environmental consciousness and historic preservation with modern revitalization. Helotes boasts several subdivisions with homes for the first time buyer to large family homes with great amenities. Take a look below for more details. Cedar Springs - Located minutes north of Loop 1604 on Bandera Road, this family friendly community offers many amenities including club house, pool, sports court, playground and jogging trails. Home prices start around $200,000 up. 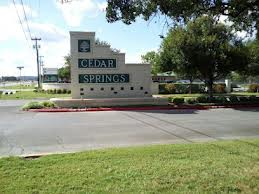 Cedar Springs was established in the early 1990s and was developed in various stages with various builders. Come and experience this family friendly community. 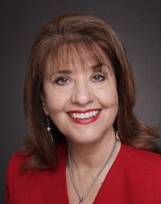 Click here to see Cedar Springs properties. 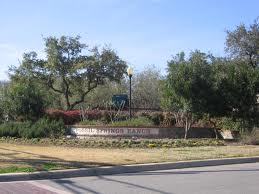 Click here to see Helotes Park Terrace properties. Helotes Park Estates - Come experience country-like living close to all the amenities of a city. Home prices range from $200,000s to $600,000s with most homesites boasting gorgeous trees. Currently this community offers no amenities. Helotes Ranch Acres - This community features 1 - 2 acre tree studded homesites. Home prices range from the mid $200,000s to $700,000s+ and is conveniently located just north of Loop 1604 in beautiful Helotes. Fossil Springs Ranch - Located 1 mile north of 1604 off Hausman Rd., this family friendly community boasts many amenities including a great pool, clubhouse, park/playground, sports courts and jogging trails. Home prices range from the mid $200,000s to $400,000s. 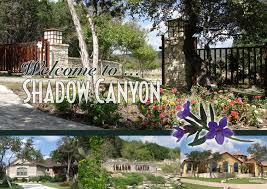 Come enjoy country living while minutes away from Six Flags, UTSA and La Cantera. Iron Horse Canyon - Located off of CR 1560. This great community offers homes ranging from $200,000 to estate homes in Iron Horse Estates over $500,000. 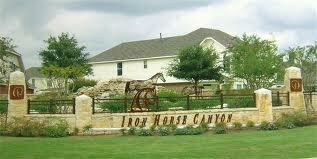 Iron Horse Canyon features a great pool, clubhouse and jogging trails. Builders include Pulte, Highland Homes and other custom home builders. The Sanctuary - This community is less than seven years old. Builders include Wilshire, Gehan and Ashton Woods. Home prices range from high $200,000 to $500,000. This community enjoys an active Homeowners Association and there are still lots available for building. Currently there are no amenities or common areas. Triana - A premire master planned gated community located approximately 6 miles north of Loop 1604 on Highway 16. This community boasts many amenities including a clubhouse, pool, playground and tennis courts. Builders include David Weekly, Sitterle Homes and Ryland Homes. Prices range from $300,000 - $500,000 for homes on 55' wide lots to $400,000 - $800,000 for homes built on estate lots. 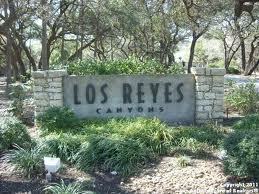 Los Reyes Elementary School is now open and conveniently located just before entering the community. Shadow Canyon - Located in beautiful Helotes just 7 miles north of Loop 1604, this gated community offers spectacular scenic views of the Texas Hill Country. Shadow Canyon's homesites average from 1 - 3 acres, many with panoramic views, gated entry, city water and overlooks Government Canyon State Natural area. Home prices average from the $300's to $800's + and built by various custom home builders. Los Reyes Canyon - Located just four miles outside Loop 1604 on Highway 16, This community is an upscale, gated community offering homes on average 1 to 3 acre homesites. Home prices average from $400's to $800'sHomes built by various custom home builders. 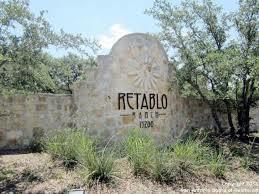 Retablo Ranch - Beautiful gated community on large natural lots averaging 5 acres or more. Retablo Ranch is surrounded by the 9200-acre State-owned Government Canyon State Natural area. Retablo Ranch is the last Hill Country area close to San Antonio that offers truly beautiful acreage lots for you to build your dream home. Homes prices start in the high $300's and up. You can pick your custom builder and build your dream home here. San Antonio Ranch - Located 4.5 miles from Loop 1604, this custom home community has some of the most spectacular views of the Texas Hill Country and homesites are still available to build in this community. Park at French Creek - A gorgeous gated community of homes built by various custom builders including Prestige Homes, Japhet and other builders. Prices average between mid-$300's to $500's. This community leads to the gated community of Acadia Heights. Grey Forest - This Historic community is nestled among oaks and rolling hills on Scenic Loop Road just north of Helotes. Many homesites have great hill country views. Residents say Grey Forest offers the feel of a getaway while close to many amenities offered by surrounding Helotes and San Antonio. It is a family friendly, quaint city, with educators, professionals and artisans choosing to live in its peaceful surroundings.